Before my sister "came along" (hmmmph! ), my parents travelled extensively. They love it. They would spend 6 weeks in Hong Kong, go to Las Vegas for a weekend, visit my Mom's family a few times per year in Vancouver. They'd be in New York every Valentine's Day, and on the best beaches in Hawaii every winter. My Mom tells me that they were "in the air" half the year. And that didn't change much when I was born -- I wish I remember my first 2 years on this planet! Based on those travels, we picked our Top 10 Favorite Beaches. The pace of travel slowed when Yuki was born. As my Dad explains it now, "2 children is 4 times the effort when traveling." Cape Cod in the late spring (now Nova Scotia instead). New York in the fall (always). Special trips from time to time (viva Roma!). So many beaches, so little time! So, in the spirit of best beaches that I have visited, here are the ones at the top of my "beach wish list." East Beach must be the beach they use on Southern California television shows. Full of people flying kites, playing volleyball and surfing. Unlike Anguilla beaches, Californian beaches are incredibly wide and flat! All this room invites people to play volleyball, have BBQs and spread out! The beach certainly appears to have a perfect balance of golden sand, the blue Pacific and palm trees that scream fun and sun. Ahhhh.... the ideal (TV) life of sunkissed skin, healthy and sporty living, and having a good time with great friends. 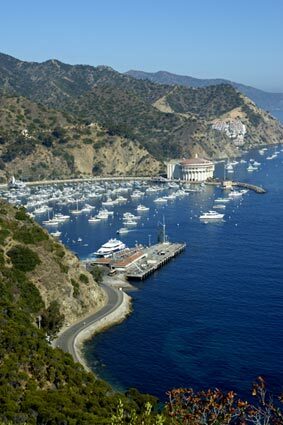 A friend once lived in Los Angeles and described her weekend visits to Catalina as trips to "mini-paradise." She claimed the area was serene and peaceful as there are restrictions to the number of vehicles on the island. The harbor is picturesque with the deep turquoise water. The shoreline curves and creates a home for rows and rows of pretty, white sail boats. Someday I'll dock my sail boat in that ideal harbor! Imagine that! Brighton is England's equivalent of Atlantic city, before the casinos. It's all still so "un-third-millennium." 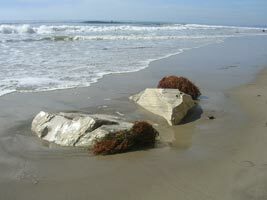 A real-live antique, the beach is secondary. It's the atmosphere. I hope I get there before that changes. Nothing screams "Mediterranean vacation" like the photo above. 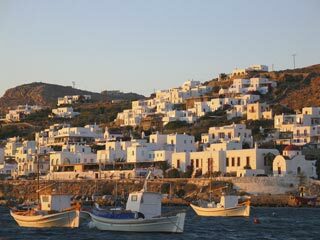 "I've been sailing through the Greek Isles," has always had a nice ring to it. So, how long before I can sail past those picturesque buildings with shutters the color of the sea? When I was but a year or so old, my parents took me to Hawaii. My Dad and I would swim, splash and play games in the warm Pacific all day. "Good-bye Great White Shark. Don't come back." That's why Clifton Beach in South Africa calls me. 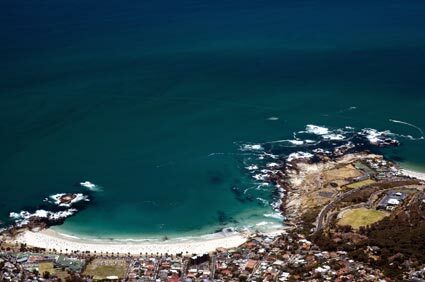 Great White Sharks await in abundance off Cape Town's coast. But don't get me wrong, I would never, ever, want to find myself floating next to one without being surrounded by strong metal bars! Sounds an awful lot like Anguilla, doesn't it? This "Anguilla of Africa" is found just off the coast of Madagascar in the Indian Ocean. 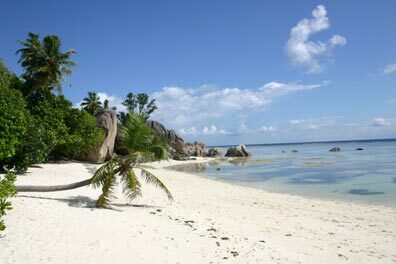 The Seychelles are made up of many islands, La Digue being the most popular. This island has it all... shallow/calm waters, soft pink sand, and plenty of exotic, African beaches for exploring! Ko Phi Phi Island, is actually two lush, tropical islands. 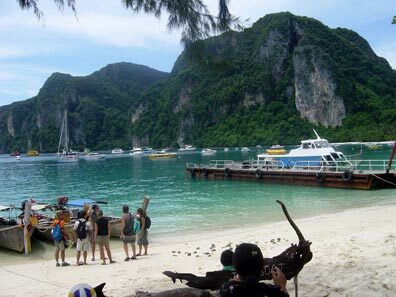 The first, Ko Phi Phi Don, has famous beaches such as Hat Yao (Long Beach). The second, Ko Phi Phi Leh, can only be accessed by boat! Exotic Thai beaches all to yourself. And you never know. I might just bump into Leonardo DiCaprio. One of his films, The Beach, was shot on the beaches of Ko Phi Phi. If it's good enough for "Leo," it's good enough for me! 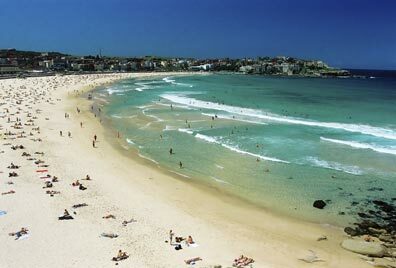 Whenever anyone thinks of the typical day at the perfect beach, Bondi Beach doesn't fall short of the fantasy. As you can see, Australia's most famous beach has it all. 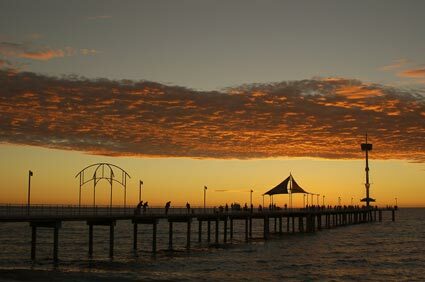 And it is more than just the ultimate in sun, surf and sand, and all the activities that go with that. It's also a suburb of one of the world's great cities, Sydney. Let me see... would I surf first or play volleyball, or go shopping in Sydney? Decision, decisions. Long, long ago my parents visited Sydney and Bondi Beach and from there, explored all the way up the Gold Coast. Sadly, I had not popped into the picture yet. So that's it - the best beaches on my "Must Visit" list. Someday I'll set foot on each one, and see if they measure up to the world's best beaches in Anguilla!